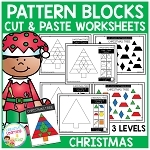 Use pattern blocks to recreate each design. This is a great activity to work on fine motor, spatial awareness, critical thinking, and shape recognition skills. Full page mats - Place the pattern blocks right on the mats. Laminate the mats for durability. Includes the following pictures: Christmas tree, Christmas tree (small), holly berries, ornament, ornament #2, reindeer, Santa, Santa hat, snowflake, and snowflake #2.